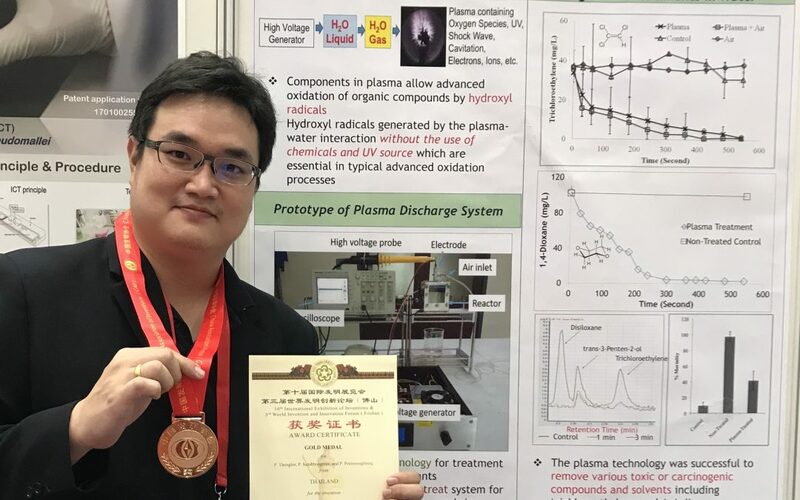 Congratulations to CEE Alumnus Dr. Peerapong (Ice) Pornwongthong for winning the Gold Medal and Special Prize for his invention of “Plasma Discharge System for Removal of Groundwater Contaminants” at the International Exhibition for Inventions (IEI) and the World Invention and Innovation Forum (WIIF) held in Foshan, China. Dr. Pornwongthong earned his Ph.D. in 2014 working with Dr. Shaily Mahendra on the designs of stable isotopic and molecular biological tools to validate biodegradation of environmental contaminants. Prior to coming to UCLA, Ice received B.S. in Biology from Mahidol University, B.A. in Political Science from Ramkhamhaeng University, and M.S. from UC Berkeley. He is an Assistant Professor (with tenure) in Environmental Technology where he carries out research and teaching in the areas of Water and Wastewater Engineering, Environmental Analysis, Microbiology, Bioremediation, Ecotoxicology, as well as Design Thinking, Entrepreneurship and Innovation. He was recently appointed as the Associate Dean for Research and Development, Faculty of Applied Science, King Mongkut’s University of Technology North Bangkok, Thailand.